It’s been said that a chain is only as strong as its weakest link. As the timeline for the health care industry’s mammoth ICD-10 implementation marches forward, industry professionals are becoming increasingly aware that if all stakeholders are not ready for the October 1, 2014, deadline, calamity could ensue. “Everyone is wondering about everyone else. That’s why communication is so important,” says Kathy DeVault, RHIA, CCS, CCS-P, director of HIM practice excellence at AHIMA. “Payers are worried about providers, and providers are worried about payers”—and for good reason. Industry professionals got a glimpse of the potential fallout that could ensue when a glitch in the mental health medical code system wreaked havoc on patient care and reimbursement schedules. An NBC News story detailed how the first major overhaul of the CPT code system since 1998 produced systemwide delays and outright payment denials. Is that the sort of mayhem in store for health care organizations next October? Steven Benjamin, UnitedHealthcare’s program director for ICD-10, believes most medium to large organizations are pretty well on track and have worked to stay in front of the ICD-10 road map but cautions that the industry likely won’t wait for others to catch up. “If we end up in a situation where providers are not ready and are submitting ICD-9 codes, there is going to be a rude awakening,” he says. New research findings suggest that industry progress has not kept up with early expectations for readiness. 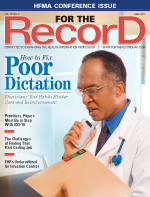 A February survey on ICD-10 preparations from the Workgroup for Electronic Data Interchange revealed that nearly one-half of the 109 payers polled expect to start external testing by the end of 2013, while a survey conducted a year earlier found that 100% of health plans expected to begin testing in 2013. Of the 778 providers surveyed this year, one-half had not set a date for completing an impact assessment, making business changes, or commencing with testing. DeVault believes there will be some inevitable early glitches, which makes regular communication imperative for identifying potential issues before they occur. It also means having the right people at the table. “Conversations should include someone in coding and patient financial services,” she says. • Is your internal testing under way? • If not, when will you begin external testing? • What kind of data do you need from us? • What kind of edits are you building into the system? • Can we review the edits? For example, the newly formed California ICD-10 Collaborative is designed to help providers, insurers, and vendors share best practices and collaborate on code-set testing, lowering risks, and reducing implementation costs. As of March, 11 health care organizations had joined the group. On the other side of the country, the Massachusetts Health Data Consortium has created a similar collaboration to establish clear communication channels among all stakeholders and ease coordination. Benjamin says UnitedHealthcare has been working with several regional collaborations to create a “common” repository of information so organizations aren’t hitting up each other individually. “It would be nice to see that happen throughout the nation,” he says. Payers and providers agree that all stakeholders should be prepared for some complications, especially in the early stages of the conversion. “It would be unrealistic for us not to expect some problems with a change this significant,” Benjamin says. To be fully prepared for all possibilities, health care organizations need to develop strategies to address shortfalls and delays, according to Nachimson. A foundational tactic for any organization is to build a cash reserve or establish a line of credit for use in the case of a disruption. Contract negotiations with various payers also should be a consideration. Nachimson suggests health care organizations discuss options for interim payments based on a percentage of payments from previous years. “For example, let’s agree that you will send a payment of one-twelfth the amount we received last year until we figure it out,” he suggests as a possible negotiation point in case of denial disputes. While it will require some up-front cost, Nachimson believes payers need to bring in additional staff for a smoother conversion. “A lot of payers learned in the 5010 implementation that they will be getting a lot of calls,” he notes. In anticipation of potential glitches, Benjamin says payers are indeed investigating staffing needs. While UnitedHealthcare had hoped to remain operationally neutral, he believes that for the short term, additional staffing will be inevitable. “I don’t think we are going to get around it,” he says, pointing out that from just a customer service standpoint, there will need to be more hands on deck to field calls and questions. DeVault says additional staffing needs to be a consideration for payers to make sure they are adequately prepared. “There is no such thing as too much preparation,” she says. In an effort to prepare for ICD-10 testing and share the best practices of early adopters, HIMSS is partnering with the Workgroup for Electronic Data Interchange (WEDI) to implement the ICD-10 National Pilot Program. The industrywide collaborative will develop a standard set of testing scenarios and identify an “asynchronous” model for small and large organizations to conduct ICD-10 testing, a critical component of readiness. Organizations may be charged a nominal fee for phase 2 and phase 3 testing. • Identify standard testing scenarios that can be utilized by the health care industry for free. • Provide resources and guidance to providers during the implementation phase through the development of a virtual regional solution center. • Publish incremental data on testing outcomes, best practices, and new findings in the ICD-10 PlayBook, a free resource. • Build collaboration and mutual trust through the sharing of ideas and best practices. • Enhance the efficiency of the testing process, thus reducing the cost of testing trial and error for most organizations. More information can be found at http://www.himss.org/library/icd-10/national-pilot-program?navItemNumber=13477.